Monaco is a name bringing thoughts of wealth and splendor. A remnant of the historical past of Europe, it is an independent State, even though it is a tiny city-state inside metropolitan France with no army to defend itself and a population of only 33,000 people. Monte Carlo is the most famous neighborhood in Monaco, and this is where the famous casino is located. The Casino de Monte-Carlo is a treasure of the Belle Epoque, but also the reference with respect to gambling for all players in Europe. Its building was built in 1863 by Charles Garnier to whom we also owe many monuments in France, including the opera that bears his name in Paris. Overlooking the Mediterranean, the casino has seen the high society of yesterday and today in a magnificent setting made of sculptures and bas-reliefs, frescoes, marble and gold. 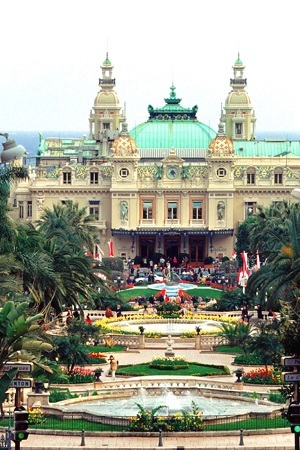 It is in the same building that is housed the Opera de Monte-Carlo with its exceptional cultural events. The Casino de Monte-Carlo has become a reference for games with all sorts of variations: Thirty and forty, Roulette, European Roulette, Chemin de fer, Bank at two tables, Punto Banco, Craps, Poker, American Roulette, Blackjack, and the expression that everyone knows seems to always resonate when thinking of Monte Carlo “Les jeux sont faits”. It is in such an emblematic place as the casino at Monte Carlo that appeared the first automatic machines and where the jackpot was invented, as well as slot machines flowing stream of their currencies in the laughter of the ladies beautifully dressed and coiffed. Over the years, the Monte-Carlo Casino has hosted new and exclusive games while creating other fairs and festivals places like Cafe de Paris, the Sun Casino or Casino summer. Obviously, in this mythical place open to persons of at least 18 years, you should be well dressed without shorts but with a jacket and cocktail dress for ladies. Who knows you may see James Bond there if you are in luck.